Marilyn SanClemente April 15, 2017 April 15, 2017 Easter, Occasions catalog, Stampin' Up! Happy Easter! Today I am sharing a card that I made with the Stampin’ Up! Easter Message Stamp set and the Carousel and Cupcakes Designer Series paper. The card base is a 8 1/2″ x 5 1/2″ piece of So Saffron cardstock scored at 4 1/4″. The next layer is a piece of Sahara Sand cardstock cut to 4″ x 5 1/4″ and embossed with the Falling snow embossing folder. The top layer is a piece of the Yellow Sunbeam DSP from the Cupcakes & Carousel Designer Series paper stack. I love this paper! I cut the paper to 3 7/8″ x 3″. The Messages are stamped using Stampin’ Up! Black archival ink on a piece of Very Vanilla cardstock and cut using the Stitched Shapes Framelits. These new framelits are great for cutting out a design that has the faux stitching around the edge. This set of framelits has 4 ovals, 4 circles and 4 squares that fit with the Layering Oval, Circle and Square framelits. For this card, I layered the message on a Scalloped oval cut from a piece of Sweet Sugarplum cardstock. The Cross is stamped on a piece of Very Vanilla cardstock. I used the new Watercolor pencils with a blender pen to color in the cross and the cloth on the cross. I then cut out the cross with a pair of Stampin’ Up! Snips (my most used and favorite tool!). 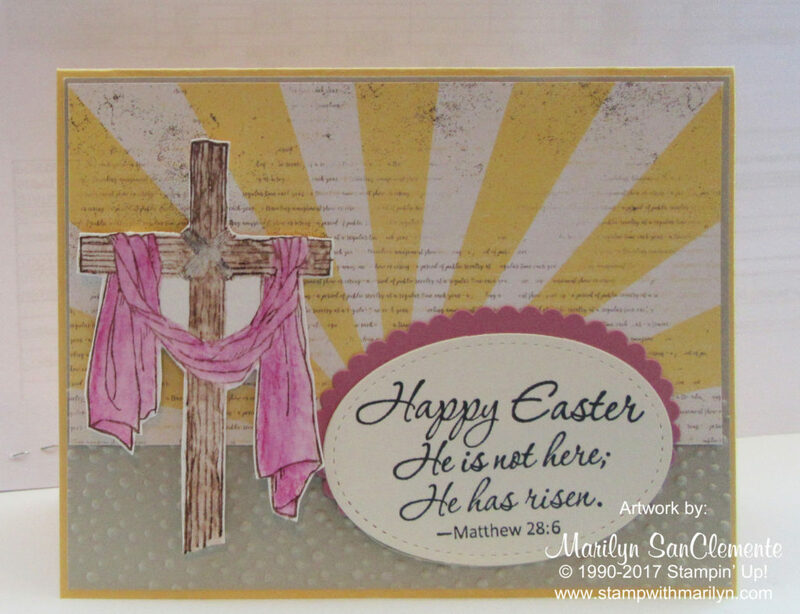 The cross is mounted onto the card using the new Foam Adhesive Strips to add dimension. Here are the supplies that I used to make this card.